I hope you had a wonderful weekend. It was cold and rainy here (as predicted) the whole weekend which means I didn’t have to leave the house once. I got to cuddle on the couch with a blanket and movies. So much fun right? Remember in this post I was having the sads because I didn’t have black and white glitter and I’ve been on the hunt for some for ages? Well I was lusting over someones Instagram photo with black and white glitter and the very generous Margaret on Instagram said she had a spare bottle and offered to send it to me. How super generous is she? I am such a lucky girl. Now she also sent me a few other polishes so I will show you all of them as well but today I am just showing you two. This is Ulta3 – Watermelon. I was so drawn to this colour when I opened my package and I knew I had to use it first. I will tell you more about Watermelon when I show you the others but for now I paired it with my super gorgeous black and white glitter and some stamping. Here I used one coat of the glitter – Stop The Press – on my pinky and index finger. On my middle and ring fingers I stamped using Pueen18 and Essence stampy polish in black. I really loved the combination. Stop the press was also very easy to use and spread well. I am so in love with this glitter AND the polishes I got. I feel utterly spoilt and can’t thank Margaret enough. Don’t you just love this black and white glitter? And Watermelon is so pretty. I can’t wait to show you all the polishes. I hope you have a lovely week. Can you believe October is almost over? ← My nail care routine. Hahaha I completely agree. I didn’t want to mention it because we don’t do halloween but it definitely is halloween isn. Thanks so much! Yeah for finally getting black and white glitter. Their possiblitilies are endless. Love mine just as much. Gorgeous mani. Thanks Lynette. I agree it is so versatile. You have one of my favourite Black and white glitters though! OK, I am in love with that colour – the watermelon is beautiful! Thanks so much Lauren. I absolutely agree with you. I love the colour too. After posting this I actually think it is very close to Sinful Colors – Pandora but I will do a comparison of them and see if I am right. AAAAAAAGH! Spazz out moment! Dude! I want a lack and white glitter so badly! 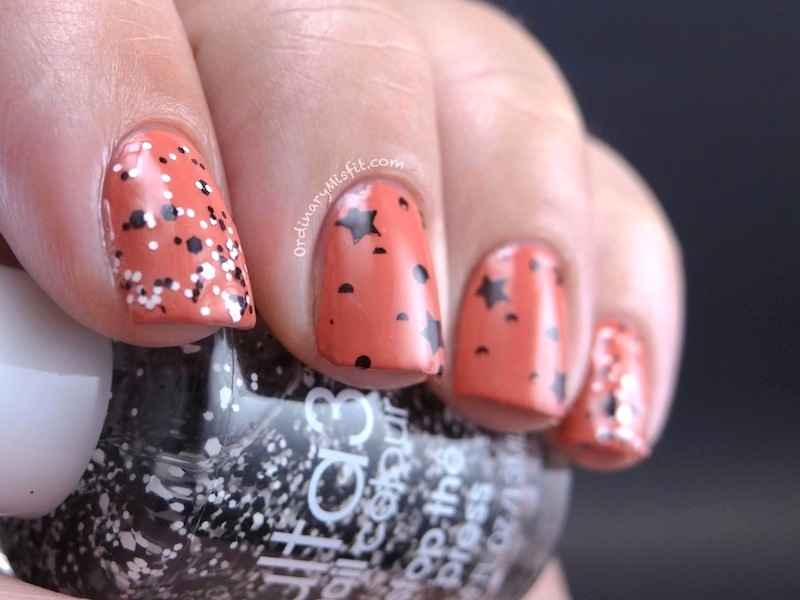 But that aside now…this mani looks awesome! Seriously! The colours, the stamping, (bites lip) that glitter! Lol love it! LOL thanks so much T! I can understand the longing. I am SO happy to have one now. Hahahahaha thanks. I do appreciate that 😉 Thanks! Love the black and white glitter! I definitely need some! Thanks Imka. I agree, you do need some. It’s so gorgeous! It’s absolutely crazy! It feels like last week when we were getting ready for Christmas and here we are again. At least you guys have Thanksgiving too. The stars are too cute:-))) Love it! love the stars! not a fan of the glitter but the stars and that colour are just divine! CharlieW recently posted…20 000 pageviews! Thank you so much!! And congrats again on winning (my) Revlon hamper 😛 I can’t wait to see it all!